In 2010, the Federal Bureau of Investigation seized the content of then-Fox News reporter James Rosen’s personal emails using a warrant issued under the Stored Communications Act. Rosen didn’t learn the FBI did this in response to a pending leaks investigation until it was reported by The Washington Post in 2013. It was also revealed in 2013 that the government obtained work and personal phone records of more than 100 Associated Press reporters without prior notice — including records of incoming and outgoing calls, the duration of each call, and the work and personal phone numbers of individual reporters. The undisclosed surveillance of Rosen and AP reporters led to backlash from the public, government transparency organizations and First Amendment advocates. These examples show how government surveillance of journalists risks reporters’ ability to communicate confidentially with sources while gathering the news. That’s why the Reporters Committee for Freedom of the Press and BuzzFeed journalist Jason Leopold are fighting to gain public access to applications, orders, and other judicial records related to electronic surveillance tools used in closed federal criminal investigations. Their case is now on appeal to the United States Court of Appeals for the District of Columbia Circuit. According to The Post, only one in every thousand surveillance applications were made public in federal courts in Northern Virginia and the District of Columbia between 2011 and 2016. During this time, electronic surveillance orders in these two courts increased by 500 percent. Even after investigations are closed, electronic surveillance court records often remain sealed indefinitely, limiting the amount of information the public has about why — and how often — the government obtains communications records using these tools. For example, in 2017, it took the Reporters Committee’s petition to unseal to reveal that the government used a court order issued under the SCA to obtain email records of a journalist connected to the investigation of FBI agent Donald Sachtleben. Sachtleben, a former special agent bomb technician, pled guilty to the charge of unauthorized disclosure of national defense information. Law enforcement officials, believing Sachtleben disclosed classified information to said journalist, applied for a court order and were granted permission to monitor certain communications in 2013. On Jan. 25, a group of former United States magistrate judges, represented by Harvard Law School’s Cyberlaw Clinic; the Electronic Frontier Foundation and Riana Pfefferkorn; a group of First and Fourth Amendment scholars represented by Hannah Bloch-Wehba and Charles S. Sims; and a coalition of media organizations represented by Davis Wright Tremaine, LLP filed friend-of-the-court briefs with the D.C. Circuit in support of the Reporters Committee and Leopold. 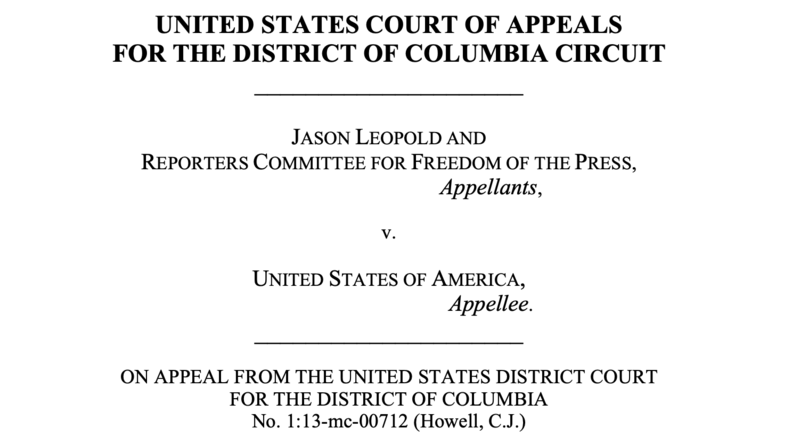 Groups writing in support of Leopold and the Reporters Committee emphasized the importance of unsealing electronic surveillance records in closed investigations to ensure transparency within our court system. “The common law right of access is grounded in the importance of judicial transparency and accountability to the public, not whether providing the records is convenient for the government,” the former magistrate judges argued in their brief. It was further highlighted that increased public access to electronic surveillance records in closed investigations would go a long way toward ensuring proper public oversight over the government’s use of powerful surveillance tools. EFF and Pfefferkorn argued the secrecy around law enforcement can it make it difficult to advocate for policy changes and laws protecting individual privacy. View the Reporters Committee’s appeal and the supporting briefs.